Tennis, especially the Grand Slam championships, has attracted more and more interest and sports betting on websites. With the strength, fitness and physical aspect of a tennis player’s game increasing, the Grand Slam games have seen some of the best tennis serves of all time in recent years. The Betsson Sportsbook gives you access to live betting on tennis matches from the US Open to the ATP World Tour. While we have a list of some of the greatest tennis serves of all time, don’t miss the next one to be added to the list! His serve was the trademark of his game as he could do anything he wanted with his delivery, finding all four corners of the court with extreme ease and deception. Sampras’ second serve was just as lethal as his first and it was often said that he served two first serves but whereas other players wanted to break the speed record, Sampras concentrated on precision. The unreadable serve during his prime was explosive and extremely accurate, capable of stringing together clusters of aces. 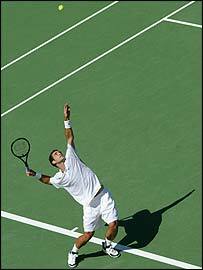 Pete Sampras’ serve was his unstoppable weapon and responsible for his 14 Grand Slam singles titles. One of the most elegant and well executed serves in the history of tennis, the American who was world number 1 tennis player for 8 years won 17 major singles titles. His service technique was immaculate and reliable, making it look effortless. Whereas, some servers went for power or placement, Gonzales went for a different approach, demoralising and concentrating on his opponent’s weakness. Moving his serve skilfully around the court, he demoralised his rivals by finding and exploiting his opponents’ weaknesses. With the nickname ‘Boom Boom’, Boris Becker’s game revolved around his fast and accurate first serve and his spectacular net game. His second serve was also effective in that it was extremely precise and well-placed. Becker’s service differed from the other players during his playing years in that he used an eastern forehand grip for his delivery. This enabled him to ensure he manipulated the power of his serve while also being able to swing it wide with a slice serve. 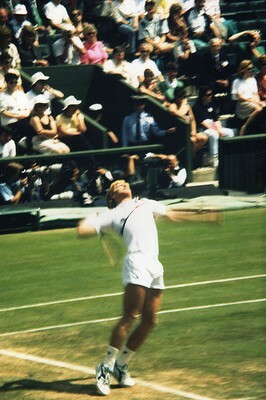 Although he didn’t necessarily have the biggest serve, Becker demanded respect as his serve meant that players couldn’t come in on it and follow to the net. This gave Becker the upper hand as he was able to keep players back and therefore would have the advantage off the serve. The 6 foot 6 inch Argentine is not only known for his strong serve but his incredibly powerful ground strokes that are considered to be one of the most commanding in the sport. Currently ranked seventh in the world, del Potro featured in the longest semi-final in the history of Wimbledon mens’ singles against Djokovic with the game lasting an incredible 4hours 43 minutes. His height allows him to get a powerful first serve often clocked in the mid-130s, that sets him up for an easier to return high topspin balls that often reach over 100mph. The 24 year old Argentine is definitely one to watch for the future and already has a Grand Slam title, beating Nadal in the semi-final and Federer in the 2009 US Open. This list would not be complete without the master of the serve, Andy Roddick. 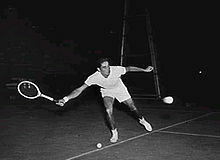 Known for his incredibly powerful serves, his serve was usually between 130-150mph that often resulted in aces. Roddick would often find himself down two points only to serve up two aces, bringing it back to deuce. Besides his potent first serve, Roddick’s second serve was also one of the best in the game. After a successful 2013 Wimbledon Grand Slam championship and with the US Open on the way in August 2013, watch out for the best serves currently in the game. Keep an eye on their technique and the analysis available to add some aspects to your own game and with a bit of practice, you could be serving like Andy Roddick or Pete Sampras.